This website has been developed on the basis of conversations between Christians and Muslims. It aims to offer answers to religious and theological questions arising from Christian-Muslim dialogue. The answers are given from a Christian perspective, with knowledge of and respect for the Islamic faith. The website provides information on frequently asked questions grouped in 15 main topics. The basis for this information is the book 'Muslims ask, Christians answer'. The website also enables users to ask their own, new questions, which are all answered personally. These answers are then added to the website, and so the website itself develops through this dialogue. The electronic search function enables searches for individual words and strings anywhere on the website and for each question separately. 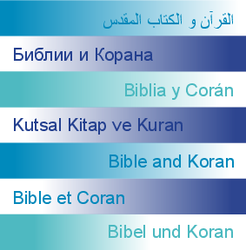 For questions relating to the exegesis of particular verses in Bible or Qur’an we offer full indices of Bible and Qur’an quotations. Are Muslims who wish to become Christians given any kind of preferment? Are there verses in the Gospels about tolerance, brotherly and neighborly love? If I can prove to you that your Bible is no longer valid, would you convert to Islam?